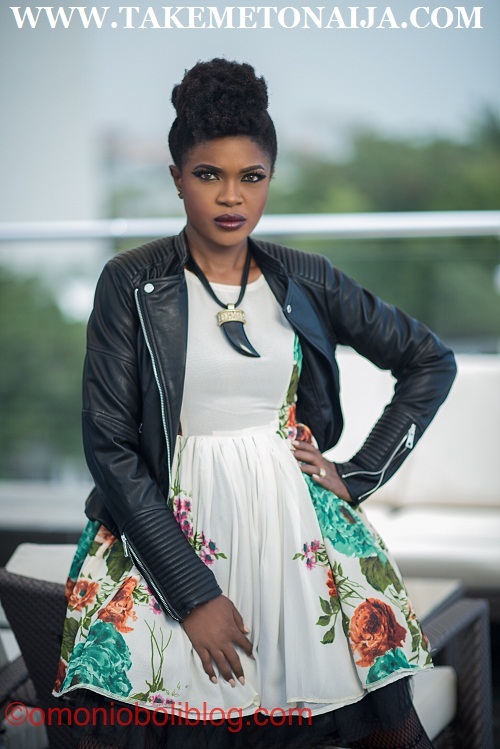 Omoni Oboli is a popular Nigerian actress, scriptwriter, director and producer. She is a trained digital filmmaker at the New York Film Academy. She is a gifted Writer, with several intriguing screenplays to her credit: including ‘Fatal Imagination’, ‘Being Mrs Elliott’, ‘The First Lady’ and ‘Wives on Strike’. Nigeria actress Omoni Oboli, was born in Benin City, Edo state, hails from Mosogar in Delta State, She had her secondary school education at Delta Steel Company Technical High School (DSC THS) Between 1989 and 1994 and went on to study at University of Benin where she holds a Bachelors degree in Foreign Languages (majoring in French, Language). In 1996, while in University she produced her First movie. She is an award winning Actress, Movie producer and script writer. Omoli Oboli got married to her Husband Nnamdi Oboli on October 28, 2000. It was fun and carefree, because there was a lot of love in the home I grew up in with my mum and sister. I lived in the then Delta Steel Company (DSC) complex, which was a haven where I got a great education and lived a pleasant lifestyle even though we weren’t rich. The memories of growing up were mostly pleasant for me. DSC is not the same as it was then anymore. You studied French Language, what prompted your becoming an actress? I think your question should be the other way round. Many people who knew me back then are still wondering why I chose French, because what I was known for was acting and directing and writing plays in the church in school plays and in the French club where I was the head of all those clubs back then in my secondary school. Acting started even before my primary school at the age of 3. I have always known acting and wanted to do it as long as I can remember so the prompting was really to study French which I felt didn’t just come naturally with me because you had to study it to know it well or live in a French country to properly communicate in it. So I studied French with my eye fully on acting. Do you sometimes regret the years that you took a break from movies? Not really. Considering what I got from the years I left, I wouldn’t trade my education, husband and my children for anything. Every other thing can wait but these blessings do not wait for you. It’s the grace of God, and I’m grateful to Him for giving me the wisdom to grab them when I had the chance. No regrets for me there, but just gratefulness! After enjoying a brief but interesting and fulfilling career in 1996, Omoni left the movie industry to complete her university education. She got married immediately after school and didn’t return to the industry till a decade later. Since her return to the industry, Omoni has fast risen to the top, playing a number of lead and supporting roles in major movies. She brings – dignity, poise, class, smooth delivery, and extreme professionalism to the varied roles she’s played. She is a gifted screenwriter, with several intriguing screenplays to her credit. These including the current blockbuster movie, ‘Wives On Strike’. In June 2007, The Rivals, a movie she co-produced with her friend, won the coveted prize for Best International Drama at the New York International Independent Film & Video Festival. It was the first Nigerian film to be premiered since the festival’s inception in 2003. The movie was given a 3 star rating out of 4 by the festival’s judges. Omoni has shot into prominence as the class act of Nollywood because of her professional demeanor and strong work ethics. Playing lead roles in wave making, blockbuster movies like ‘The Figurine,’ ‘Anchor Baby’, ‘Being Mrs Elliott’, and the soon to be released movies, ‘Feathered Dreams,’ and Mo Abudu’s ‘Fifty’ has set her apart as one who knows how to choose good screenplays. She has also set the bar higher by being the first actress from Nollywood to bag such international awards as Best Actress in two international festivals in the same year (2010) that are not organized by Nigerians or Africans. This she did at the Harlem international film festival and the Los Angeles Movie Awards for her lead role in the movie, ‘Anchor Baby’. Omoni starred in the movie Okafor’s law, which premiered on March 24, 2017. However the movie premiere was cancelled due to an injunction by the court; Omoni is currently being accused of copyright infringement by Jude Idada, he claims to have written the storyline behind Okafor’s law. Several attempts were made to reach Omoni before the premiere date, but she feigned ignorance. The movie was set to be released in cinemas, March 31st. The court case against Omoni shed light on the theft of intellectual property in Nigeria. Tell us about your first onscreen experience? I was a ‘waka pass’ in my first experience. I played a secretary in one movie and Liz Benson‘s maid in another movie, ‘Shame‘. For me, any role was better than no role. I was too excited to be in the movies to worry about what role I played, and I was protected then by the producers and actors who saw my talent and were all too willing to give me the chance I needed to get ahead in the industry. I remember Opa Williams always making sure that I was okay and that I wasn’t being harassed by anyone. Those early days were just fun and goofing around for me. I was just passionate about being in the movies and when Fidelis Duker gave me the lead role in two of his movies, ‘Not my Will‘ and ‘Destined to Die‘, I was elated. This opened the door for Hilda Dokubo to give me the lead in her own production, ‘Another campus tale‘. I wonder where those movies are now? I would love to have a copy myself. How did you meet your husband and what’s your love story? I met him when I first started acting in Lagos in 1996, but just for about a few minutes. He later found me four years later in my final year and we started dating. He proposed to me two weeks into our relationship and the rest is history. There’s a great love story there somewhere. (Laughs) He must have rocked my world to the point of me saying yes, because I was just 21 years old! Many felt I was too young, but I thank God that their opinion didn’t sway my decision. Feeding and giving over two hundred poor and disadvantaged children at Delta Steel Complex, Aladja, a fun day with practical gifts. Broadening the mindset of the less privileged children by taking the children of Ecole Divine Nursery Primary and Secondary School to a milk factory to see how it is made and packaged. This is just to mention a few, with plans to do much more, as their needs are endless. In 2010 she won the award for Best Actress – Narrative Feature at the Los Angeles Movie Awards, and the award for Best Actress at the Harlem International Film Festival. In 2014, Omoni won Big Screen Actress of the Year award, at the 2014 ELOY Awards, for her movie Being Mrs Elliott. In 2015, Omoni was awarded the Sun Nollywood personality of the year. She has also shown, with her movies, ‘Being Mrs Elliott’, ‘The First Lady’, ‘Wives on Strike’, and most recently ‘Okafor’s Law’ her talent behind the camera as the Director.